Me: I fell asleep watching the Golden Globes. The last thing I remember was Drew Barrymore giving her acceptance speech. Did you watch? If so, what was your favorite part?Lynn: No I didn't get to watch because we don't have cable and we watch everything online. When we did have cable we used to turn awards shows into games for me and my husband to play. We would make guesses and the winner won nothing but a pat on the back and bragging rights. Me: I love watching the red carpet arrivals just to see the couture gowns, but the rain ruined it! I give Heidi Klum's dress two thumbs up. Who in your opinion is always best-dressed at an awards show?Lynn: For a good long while it was my girl Halle Berry, but now I think that Tina Fey as far as I can tell delivers the goods each time. I like that she pulls off goofy glam! Me: There was some criticism about Mariah Carey's dress. Did you think it was too tight and revealing? Lynn: Hold on let me Google it...be right back...okaaaay, she's made it quite clear that she's a woman in that dress but how bout a little less cleavage? I definitely think it was too tight and revealing, especially when it seems she uses her dresses as an excuse every time she makes a "kinda" drunken looking acceptance speech - "Oh it was my dress!" Me: As a mommy of a baby girl, I am already worried about how Hollywood standards of beauty will affect her self-esteem. You have a daughter, what do you teach her about body image? Me: My siblings and I weren't allowed to watch rated PG-13 or R movies when we were growing up, but a lot of our classmates did. They were the cool kids. Would you take your children to see a movie like Twilight, for example? Why or why not? Lynn: I also was not allowed to watch those kinds of movies until I was 13 and when I was old enough to watch rated R movies, I had no desire to because of their content. I would never take my children to see Twilight because from what I have read about it and have heard, it doesn't sound like the type of movie to take young kids to. I don't believe in immortal souls anyway because it basically goes against what I've learned in the Bible. And no matter if they are young, hot, up and coming Hollywood actors, what they portray I personally don't feel should be glamorized and packaged towards our youth. Me: I didn't get to see any of the movies that are in contention for Oscars this year, so I have no educated guesses as to who will win. Do you have any Academy Award predictions? Lynn: I get so confused as to all things awards shows. I really have no clue who is invited to that party, but if someone acts up, I will be Googling them the next morning that's for sure! Me: If I were a filmmaker, I would make a documentary on fast food chains. Oh, wait that's already been done...never mind! What kind of movie would you make? Me: I'm really missing the cinema, but I'm content with renting movies for now. What movie do you recommend everyone see that out on DVD?Lynn: Speaking of documentaries, I just saw a mind blowing, eye-opening one called "The Cove." It's a real thriller and it's also pretty tragic that it's actually real. It's not a kids movie by any means, so make sure any dolphin lovers are not nearby. Me: You know I am passionate about natural living, but shopping can be frustrating because the word "natural" on a label can be misleading. What is one truly natural product everyone should buy to lead a healthier lifestyle? Lynn: There are just so many great things nowadays, but I'll go with one that is great for our skin and tell you about this awesome lotion that I'm into right now. It's ecoTOOLS Nourishing Shea Butter Body Lotion and I found it at my nearest Walgreens. You can find it online. It's 98% natural and it smells like a fruity cocktail. It will make you want summer in a heartbeat. Me: I feel it's important to start my daughter off on the right foot, by using natural products with her. It's not always easy or economical. What is one simple, inexpensive natural product all parents can get for their child(ren)? Lynn: Okay this one inexpensive and must have (especially having small accident prone children) thing that we use here is an aloe vera plant and a jar or bottle of 100% Cocoa Butter. Growing up, any scrape or booboo got slathered with a piece of fresh aloe off the plant (trim the pointy spikes off so you don't cut yourself or the children) and rubbed with some Cocoa Butter and then the Band Aids were applied. It cuts down on scarring tremendously. It heals the wounds quickly and aloe has bacteria fighting capabilities in it. To this day, you can't tell where I got major road rash when I skidded down our hill after falling of my bike as a child. Inexpensive and effective - I promise. 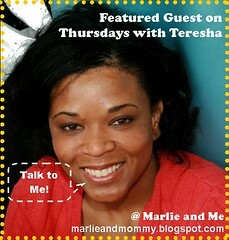 Thanks so much for the interview and this great showcase on Thursdays. I linked over to you so people get to see other parts of my personality. Thanks! Great Interview! I too miss going to the movies. I had the thrill of taking my 3 1/2 to see his first movie a couple of weeks ago, and my first on in ohh 4 years!!! It's been a while since we've been to the movies. I don't watch the awards shows anymore, because I don't even know what's going on! Great interview. I like to getting to know about others. You see what all you have in common.